FOOTHILL RANCH, CA (BRAIN)—Oakley reported higher quarterly profit, in line with analysts' estimates. Oakley said third-quarter net income rose 37 percent to $23.7 million, or 34 cents a share, from $17.3, or 25 cents, a year earlier. Sales increased 25.5 percent to $263.8 million. FOOTHILL RANCH, CA (BRAIN)—Oakley saw second quarter net sales jump 29.3 percent to $263.2 million, from $203.6 million in the same quarter last year. 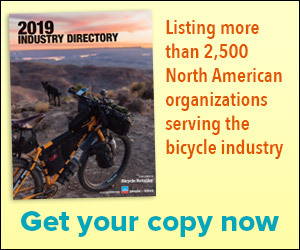 TORONTO, Ontario (BRAIN)—Canada’s independent dealers sold an estimated 341,000 bicycles worth about $148.5 million Canadian ($131.4 million U.S.) last year, according to projections made from the country’s first data capture program. DUARTE, CA (BRAIN)—Dahon just announced record sales for the first half of 2007. Unit volumes of bicycles sold grew by 27 percent to 180,000 units, and revenues increased by 36 percent compared to the period a year earlier. Both unit volume and revenue numbers represent all time highs for Dahon.